The Shoreline Trail is a continuous multi-use pathway along Lake Erie and the Niagara River, within both Erie and Niagara Counties. The Beaches sections of the Shoreline Trail consists of the construction of a multi-use pathway in the Town of Evans and Town of Brant. This is part of a larger effort to form a continuous multi-use pathway along Erie County's Lake Erie and Niagara River coast line. This area of the County has a wealth of natural, recreational and scenic resources, predominantly running along Evans 13-mile Lake Erie shoreline. Six public parks provide access to Lake Erie including Sturgeon Point Marina, Wendt Beach Park, Bennett Beach, Evans Town Park, Lake Erie Beach and Evangola State Park. Additional assets include Frank Lloyd Wright’s Graycliff Estate, and numerous scenic vistas. The proposed Evans Multi-use Pathway seeks to connect and expand access to these assets through the introduction of an alternative transportation infrastructure. 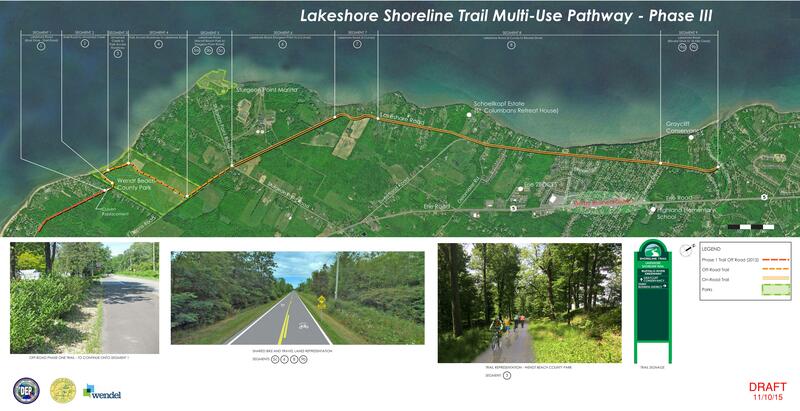 The pathway will predominantly follow Old Lake Shore Road, a National Scenic Byway and be part of Great Lakes Seaway Trail extending along New York State’s coast line of Lake Erie, Niagara River and Lake Ontario. To guide this development a concept plan was developed in 2003. Although some details may have changed since the creation of the plan, the overall concept and goal is the same. Phase 1 is an eight foot wide, off road multiuse pathway extending approximately 1.5 miles from the County’s Wendt Beach Park to Bennett Beach Park, starting at Roat Drive (just south of Wendt Beach Park) parallel to Old Lakeshore Road in the Town of Evans. The trail opened in 2014. It was funded with a combination of federal, state, and county dollars. An 8 foot off road bicycle path will extend from Erie County’s Bennett Beach Park to the Evans Town Park parallel to Old Lakeshore Road in the Town of Evans. This is a distance of 1.5 miles. The project has been designed but construction is on hold pending road infrastructure investigations. The pathway is being funded through a combination of county and federal sources. For the past 30 years, the former Bethlehem Steel property has symbolized our region's heavy industrial decline and has been a blighting influence on the City of Lackawanna and the Buffalo Niagara region in general. This property also created a barrier for Lackawanna residents to access to waterfront amenities. This section of the Shoreline trail will connect to the previously built Outer Harbor Shoreline Trail, to enable safe access for Erie County residents and visitors to recreational amenities including the proposed Buffalo Harbor State Park, Gallagher Beach, Tifft Nature Preserve, and the Times Beach Bird Sanctuary. Thursday, July 14, 2016 - Public Information Meeting. 4:30pm to 7:00pm, City of Lackawanna Council Chambers, 714 Ridge Rd, Lackawanna, NY.